The normal process of aging eventually leads to decreased skin tone and firmness and the appearance of visible wrinkles, but one way to rejuvenate aging skin is a technique called skin boosting. Skin boosting is the placement of hyaluronic acid (HA) deep in the dermis to replenish what is lost with time. The objective of skin boosting is to improve skin health without volumizing the skin. This educational article expands on a recent CME activity in which Dr. Andreas Nikolis demonstrated microinjection skin boosting techniques on the lower face and cheeks, hands, and décolletage of patients using non-animal origin, stabilized hyaluronic acid (NASHA®). HA is a naturally occurring polysaccharide that is a critical component of normal, healthy skin 1. Decreased levels of HA in the dermis, which results from the normal aging process, lead to the most visible alterations of aging skin, including wrinkling, dryness, and decreased elasticity 1,2. NASHA® is a small-particle, non-animal origin stabilized HA developed in 2004 to help facilitate the rejuvenation of aging skin. Its low degree of natural cross-links coupled with a limited number of synthetic cross-links provides a minimally modified version of natural HA, whose stabilized structure has viscoelastic properties important for achieving optimal esthetic outcomes 3. There are a number of acceptable injection techniques for skin boosting. These include the 1) short linear technique (See Image 1); 2) micropuncture technique (See Image 2); 3) linear technique; and 4) fanning technique. Dr. Nikolis indicated that two of the most commonly used microinjection techniques for skin boosting are the short linear technique and the micropuncture technique. 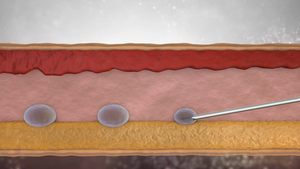 Both techniques are demonstrated in the Skin Boosting Technique: A New Approach to Hyaluronic Acid Microinjection CME activity and use a syringe that deposits 10 microliter aliquots spaced approximately 1 cm apart in the deep dermis. A 2018 expert consensus on the use of NASHA® supported use of the skin boosting technique on the lower face and cheeks, hands, and décolleté (although a broader use was also agreed upon) (4). While skin boosting can be performed on women and men between the ages of 18 and 70, the ideal candidates are generally between 30 and 65 years of age (4). 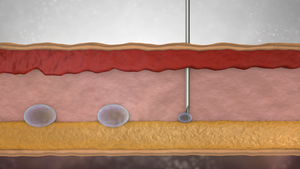 When optimal injection techniques are used, adverse events are mild but can include temporary erythema, swelling, and bruising, which are associated with the procedure and not with NASHA®. No severe adverse events have been reported in clinical studies (5). As mentioned, skin booster microinjection techniques most commonly deposit 10 separate microliter aliquots about 1 cm apart in the deep dermis. Participants of the 2018 NASHA® expert consensus also confirmed that the use of the SmartClick™ system ensures high precision during the injection of NASHA® skin booster. 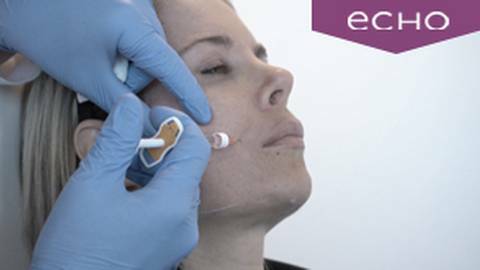 The SmartClickTM system is also demonstrated in the Skin Boosting Technique: A New Approach to Hyaluronic Acid Microinjection CME activity; however, this system is not yet approved for use in the United States. 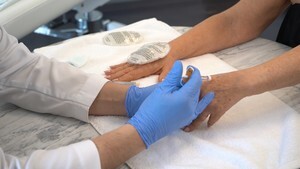 These clinical studies confirm that injection of HA using skin boosting techniques is associated with reduction of wrinkles, as well as improved skin texture, firmness, and hydration. Moreover, results are progressive and persistent with repeated treatment (2,4,11). Skin boosting using NASHA® has been shown to be a safe and effective approach to improving skin health without volumizing. Not only that, but outcomes are progressive and persistent with repeat treatments, with high rates of patient satisfaction. Distante F, Pagani V, Bonfigli A. Stabilized hyaluronic acid of non-animal origin for rejuvenating the skin of the upper arm. Dermatol Surg. 2009;35:389-394. Landau M, Fagien S. Science of hyaluronic acid beyond filling: Fibroblasts and their response to the extracellular matrix. Plast Reconstr Surg. 2015 Nov;136(5 Suppl):188S-195S. Brandt F, Bassichis B, Bassichis M, O’Connell C, Lin X. Safety and effectiveness of small and large gel-particle hyaluronic acid in the correction of perioral wrinkles. J Drugs Dermatol. 2011;10(9):982–987. Belmontesi M, De Angelis F, Di Gregorio C, et al. Injectable non-animal stabilized hyaluronic acid as a skin quality booster: An expert panel consensus. J Drugs Dermatol. 2018 Jan 1;17(1):83-88. Nikolis A, Enright KM. Evaluating the role of small particle hyaluronic acid fillers using micro-droplet technique in the face, neck and hands: a retrospective chart review. Clin Cosmet Investig Dermatol. 2018;11: 467-475. 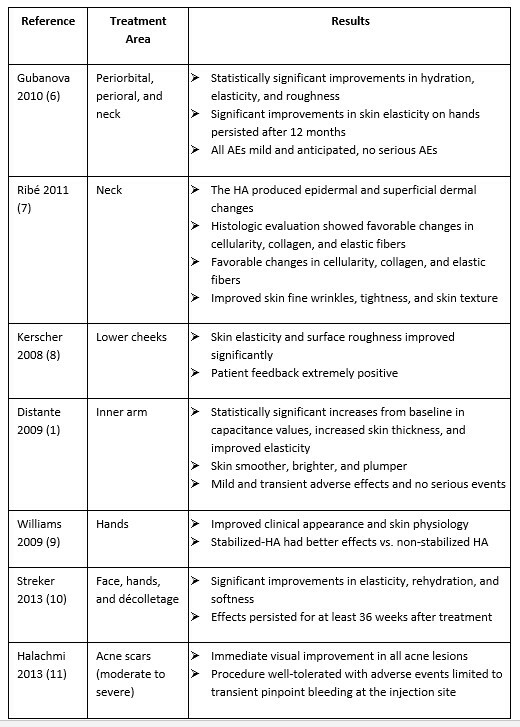 Williams S, Tamuric S, Stensvik H, Weber M. Changes in skin physiology and clinical appearance after microdroplet placement of hyaluronic acid in aging hands. J Cosmetic Derm. 2009;8:216-225. Streker M, Reuther T, Krüger N, Kerscher M. Stabilised hyaluronic acid-based gel of non-animal origin for skin rejuvenation: face, hands and décolletage. J Drugs Dermatol. 2013 Sep;12(9):990-994. Halachmi S, Ben Amitai D, Lapidoth M. Treatment of acne scars with hyaluronic acid: an improved approach. J Drugs Dermatol. 2013;12(7):121-123. There’s a new aesthetic medicine technique gaining traction outside of the United States. The normal process of aging leads to decreased skin tone, firmness, and the appearance of wrinkles. This article will introduce the technique of skin boosting that is commonly utilized outside the United States to improve the overall appearance and health of skin without volumizing. Dr. Nikolis receives consulting fees, is a speaker and conducts contracted research for Allergan, Galderma and Merg. This activity is designed to meet the educational needs of plastic surgeons, facial plastic surgeons, practicing aesthetic dermatologist and other aesthetic medicine practitioners.